Onyx is a form of chalcedony, which is microcrystalline quartz. It is formed in the gas cavaties of lava. When the stone has a black base and a white upper layer, it is referred to as onyx. Black Onyx is uniformly black chalcedony. Much of what is referred to as "black onyx" is gray chalcedony that has been chemically treated to turn it into a rich black. 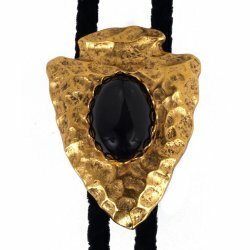 The name "onyx" comes from the Greek for "fingernail." According to myth, Cupid trimmed the nails of the sleeping Venus. The Fates turned those clippings into stone to prevent even a part of Venus from dying. Black has been associated with regeneration and new beginnings. Black onyx is thought by some to have protective qualities, making it advantageous to carry when one is traveling. It is said to be useful in fighting basic fears and in helping to create the opportunity to move beyond bad relationships--and to heal old emotional wounds. The Romans associated it with courage and it is thought to be useful when one is defending him/herself against unfair criticism.